Mixed Emotions – Who Dried My Jeans?! On August 12, 2015 August 13, 2015 By Who Dried My Jeans?! I’m struggling this morning with some mixed emotions. 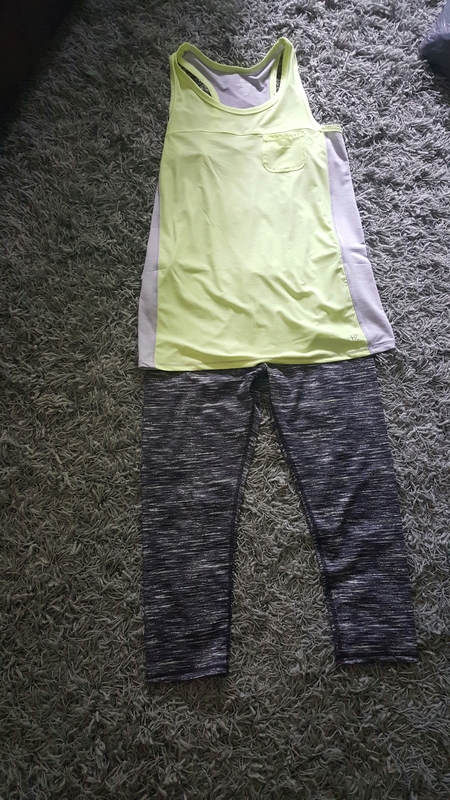 You see, a couple months ago I was exercising with my younger, hipper sister on our family beach trip when she suggested I upgraded my workout wear for something that looked a little less homeless. To clarify, when I say “exercising”, it means walking at a brisk pace with intermittent faster walking that we like to call jogging, that makes us feel better about going out for ice cream later on in the evening. I don’t think I have really purposely worn workout clothing since I was in high school and would wear biker shorts and a sport bra to the gym. I’m not kidding I can’t believe I did that either. We all did it though. I also remember however, thinking it was cool that my percent body fat was equal to my age, which at that time was 18. In my mind, I wasn’t interested in wearing workout clothing until I felt I looked good in them. I didn’t want to draw attention to myself. 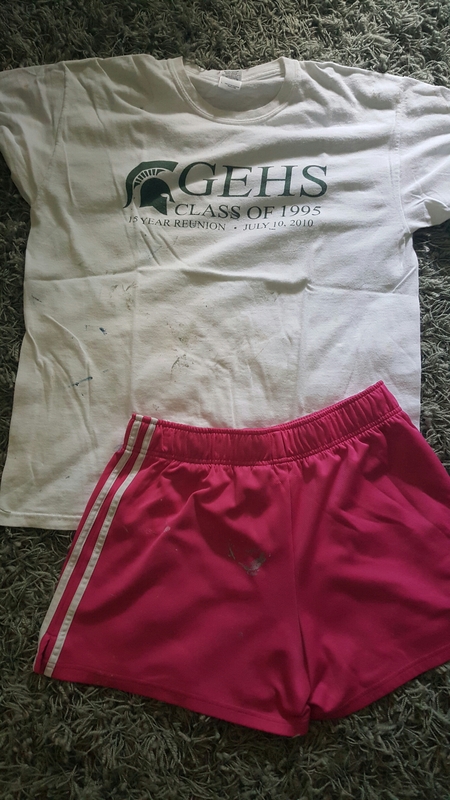 Therefore, I’d usually just throw on an oversized t-shirt, often the one from my High School 15 year reunion, along with an old pair of athletic shorts that doubled as my painting pants and had hints of every wall color in my house on them. It just felt safe… Other than when I was walking alone that is. 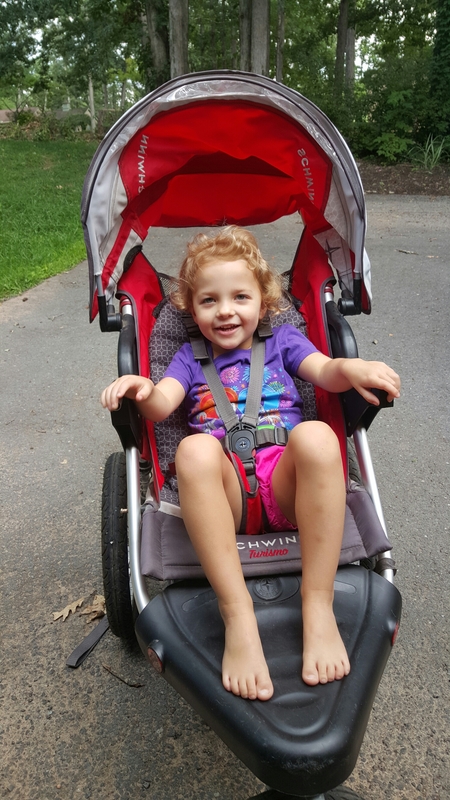 When I wasn’t pushing my jogging stroller I was regularly concerned that drivers passing by might assume I looked down and out and was walking to get a gas can and might offer me a ride. To avoid the possibility that I might truly get in a car with a stranger to avoid the embarrassment of telling them, “no, I’m just exercising”, I’d pump my arms vigorously and walk in a manner hoping to exude the fact that I had no true destination or goal other than to return to my home after walking around in circles for 45 minutes. In the exact same way, I’d definitely answer “$10” if a passer byer of my yard asked, “how much will you take for that bike?” Just so I wouldn’t have to admit I wasn’t having a yard sale. I would like to make one clarification, I do not, I repeat, DO NOT wear my stroller leash on my wrist to try and fool people that I am a runner that intermittently lets go. I simply have very weak ankles and one, even small, acorn could have me down in a flash and I know I would never again be able to happily sing “The West Virginia Hills” without remembering the time I had to watch Haley tackle one alone in her stroller without a driver. Laura convinced me otherwise and I went shopping. I took three young critics, whose behavior might make you think they were rabid monkeys, into the handicapped dressing room to try on my new workout wardrobe. Unable to make a decision on my own and not trust my monkey’s opinions, I took several things home to try on for my sister the next time she was in town. It felt like prom all over again. I even consider accessorizing with a new pair of tennis shoes and maybe a headband but then thought that might be pushing my new look too far. I kept everything she didn’t laugh at and returned the rest. On Monday I think I took my first walk ever where I matched… and it felt good. I even think my more fitted t-shirt that said, “Just Do It” even helped me push Haley up some tough hills. When the first car passed me I could almost feel them thinking to themselves, “Hey, she’s working out”. I did wonder however, if they questioned if I had under pants on. I then reassured myself that while I didn’t specifically put on any separately, my new shorts had some in them that made it count. Today was a little different however. I wore some capri length spandex and a flowy tank top that I believe was designed to modestly cover your bum but left the bottom third of mine exposed. I was cool with that though, telling myself that surely “they” wouldn’t make spandex pants in sizes that wouldn’t look good, right? Pingback: Day 2 Hair | Who Dried My Jeans? !